"His Mountain. His Peace. His Great Hunts. His Young Bride. With All That, It Should Have Been Different." 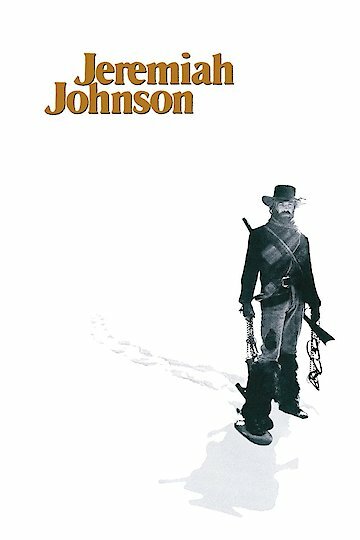 Jeremiah Johnson is a 1972 western adventure movie about a lone trapper who lives in the wilderness of the Rocky Mountains. Mexican War veteran Jeremiah Johnson (Robert Redford) heads West to find a new life as a mountain man. Johnson finds mountain living to be very difficult. Inexperienced and unprepared, Johnson nearly starves his first year. After spending time with an elderly trapper and bear hunter, Clap Paw Chris Lapp (Will Geer), Johnson picks up some new skills. While hunting, Johnson comes across a deserted settlement that has been attacked by Indians. The only inhabitants are a hysterical woman and a mute boy. The boy, Caleb (Josh Albee), is taken by Johnson at the woman's insistence. He and the boy leave the camp and find mountain man Del Gue (Stephan Gierasch) buried in sand up to his neck on his horse. Johnson frees Gue, who takes him and the boy to a local Flathead Indian village. An unintentional insult results in the Flathead chief giving Johnson his daughter, Swan, as a gift. Gue parts ways with Johnson, leaving him with a mute boy and an Indian bride who can only speak French. Several months after settling down in the wilderness, Johnson and his bride grow closer. After a wagon train of starving settlers gets stuck in the snow, the U.S. Army asks Johnson to guide them out of the mountains. The Army insults the Crow Indians by taking a route through their burial grounds. After setting the wagon train towards its destination, Johnson heads back home. At the burial ground, something startles Johnson, who races towards his cabin. Inside he finds that the Crow have slaughtered Caleb and Swan. Johnson in turn, finds and kills the Crows who killed his family. Every Crow in the area now seeks out Johnson for battle. His bravery is honored by the Crow with monuments and tributes. As Johnson travels to find another home, he encounters another Crow Indian. Instead of fighting, the Indian gives an open-hand gesture of peace. Jeremiah Johnson is currently available to watch and stream, buy on demand at Amazon, Vudu, Google Play, FandangoNow, iTunes, YouTube VOD online.